We all know what water damage can do to your homes exterior, but it really hurts when the water makes its way into your house. The exact thing just happened to me and caused me to pull up roughly 200 Sq/ft of hardwood floor to dry out my basement. I really did not want to spend thousands of dollars on a gutter guard system and being a resourceful (cheap) guy it I knew deep in my gut I could come up with a much cheaper system. This is the system I came up with. Now this system comes with all the usual disclaimers attached and as always, take any info dredged from the internet with a cautious eye. So far it is working fine but time will be the ultimate judge. Let’s get on to it…..
Start out with a product called Gutter Guard, If you can’t find the exact brand I’m sure you can find others I’m sure stores like Home Depot have others Basically its a 6 in wide by 20 ft long with plastic mesh. The way this is supposed to be used is would not work with me as I have hidden gutters and they are much wider then conventional gutters. So I had to create a new system. So I came up with this.. 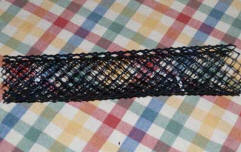 Roll the mesh into a tube as described below, you can use either Zap Straps or twist ties if you are stuck. This will create a tube that is about 1 1/2″ wide. Just make the the length of the gutter you are protecting. ****another good idea is to put the wire mesh bulb in the drain hole as this help keep the leaves out. Well the next part is pretty easy , just place the tube in the gutter and secure it down somehow, I just used metal strapping I had lying around as this was an after thought for me. The whole concept is based on the thought that as long as there is at least a tunnel leading to the drain hole then then I should be able to avoid more overflowing gutters. Of course the best method is just keeping them clean. I was caught this year unprepared. I have many broad leafed trees that did a major dump during a wind storm and they completely filled some of my gutters, water streamed down the wall and right into a basement door. Hopefully this little tip may help, I don’t claim to be an expert on gutters but this was a very cheap system and hopefully it may help you also. Let get on to it….. Roll the mesh into a tube as described below, you can use either Zap Straps or twist ties if you are stuck. This will create a tube that is about 1 1/2″ wide. Just make the the length of the gutter you are protecting. ****another good idea is to put the wire mesh bulb in the drain hole as this help keep the leaves out. Fall rains, and potentially imminent snow can be a very serious cause for concern. Proper drainage around the foundation of a house is important, as is the protective envelope of the building itself, including the roof. It is most logical to begin your inspection from the roof, down to the ground. The vast majority of residential roofs are either a single peak roof, or a combination of multiple peaks. Most residential roofs are protected with asphalt shingles, cedar shakes, tile (and concrete), or slate. To a lesser extent there are also flat roofs, and metal clad roofs. You are likely already aware of any leaks in your roof from water dripping into your house, or from the attic inspection. In getting onto your roof, use only an approved ladder, and be sure to take as many safety precautions as possible. (Setting up at the lowest point, using a 1 to 4 ratio for the angle, having a spotter, etc) Avoid walking on the roof as much as possible. This is often necessary, however it is much more likely to cause damage to the roofing material. The most common places for water to penetrate a roof are in valleys where two roofs meet, at the bottom of the roof near the gutters, and around vents, chimneys, skylights, or near flashings found where the roof butts up against a second or third floor exterior wall. If you are trying to repair damaged asphalt shingles, this is something that the average house owner can do themselves. There is a lot of information on doing this repair, but a straight forward step by step instruction can be found at Do-it-yourself.com. Repairs for slate, tile, cement, cedar shakes, metal or flat roofs are best handled by a professional contractor. Mildew can also become a problem on shake and asphalt roofs. 3M makes a product that prevents mildew from attaching to asphalt shingles, and there are cleaners available for shake roofs, however both of these jobs are best handled by a professional roofing contractor. While on your roof, it is also wise to check and lubricate attic (whirly bird) vents, and to inspect exhaust vents for plumbing, furnace, hot water heaters, and chimney’s. Check that these are not blocked, and that the roofing material is not damaged where it meets the flashing. Check the tension of guide wires, if any, for high chimney’s. Houses have many types of protective envelopes on the exterior walls. Siding, singles, stucco, slate, brick, stone, cement and metal cover almost all homes. Depending on where you live, the northern exposure usually receives the most damage from moisture and weathering. Because of limited exposure to the sun, mildew tends to grow on North faces, which can lead to rot, and premature failure of many wood and stucco envelopes. Excessive mildew should be brushed off, and the surface should be washed. An excellent environmentally friendly product is made by Biowash, and is available at most home centers. When checking wooden aspects of house exteriors, the paint is the primary protection from the elements. Check for peeling, bubbling, and cracking. Identify area’s that will require repair and re-painting as soon as damage is found! Delaying repairs may result in subsequent damage that will require significant work to repair. You should walk around the perimeter of your home to check the foundation. At no point should the grade rise above the concrete foundation. If you find the grade is against the wooden sill plate, it is likely you will have water damage and/or pest damage. The grade must be lowered, and sloped away from the house to help move water from around the foundation. Water damage is the number one cause of exterior damage to homes. Catching it quickly (within one season) will prevent serious damage that would ultimately require more than just paint to repair. It is most logical to begin your inspection from the roof, down to the ground.The roof :The vast majority of residential roofs are either a single peak roof, or a combination of multiple peaks. Most residential roofs are protected with asphalt shingles, cedar shakes, tile (and concrete), or slate. To a lesser extent there are also flat roofs, and metal clad roofs.You are likely already aware of any leaks in your roof from water dripping into your house, or from the attic inspection. In getting onto your roof, use only an approved ladder, and be sure to take as many safety precautions as possible. (Setting up at the lowest point, using a 1 to 4 ratio for the angle, having a spotter, etc) Avoid walking on the roof as much as possible. This is often necessary, however it is much more likely to cause damage to the roofing material. The most common places for water to penetrate a roof are in valleys where two roofs meet, at the bottom of the roof near the gutters, and around vents, chimneys, skylights, or near flashings found where the roof butts up against a second or third floor exterior wall.If you are trying to repair damaged asphalt shingles, this is something that the average house owner can do themselves. There is a lot of information on doing this repair, but a straight forward step by step instruction can be found at Do-it-yourself.com. Repairs for slate, tile, cement, cedar shakes, metal or flat roofs are best handled by a professional contractor.Mildew can also become a problem on shake and asphalt roofs. 3M makes a product that prevents mildew from attaching to asphalt shingles, and there are cleaners available for shake roofs, however both of these jobs are best handled by a professional roofing contractor.While on your roof, it is also wise to check and lubricate attic (whirly bird) vents, and to inspect exhaust vents for plumbing, furnace, hot water heaters, and chimney’s. Check that these are not blocked, and that the roofing material is not damaged where it meets the flashing. Check the tension of guide wires, if any, for high chimney’s.Siding:Houses have many types of protective envelopes on the exterior walls. Siding, singles, stucco, slate, brick, stone, cement and metal cover almost all homes. Depending on where you live, the northern exposure usually receives the most damage from moisture and weathering. Because of limited exposure to the sun, mildew tends to grow on North faces, which can lead to rot, and premature failure of many wood and stucco envelopes. Excessive mildew should be brushed off, and the surface should be washed. An excellent environmentally friendly product is made by Biowash, and is available at most home centers.When checking wooden aspects of house exteriors, the paint is the primary protection from the elements. Check for peeling, bubbling, and cracking. Identify area’s that will require repair and re-painting as soon as damage is found! Delaying repairs may result in subsequent damage that will require significant work to repair.Foundation:You should walk around the perimeter of your home to check the foundation. At no point should the grade rise above the concrete foundation. If you find the grade is against the wooden sill plate, it is likely you will have water damage and/or pest damage. The grade must be lowered, and sloped away from the house to help move water from around the foundation.Water damage is the number one cause of exterior damage to homes. Catching it quickly (within one season) will prevent serious damage that would ultimately require more than just paint to repair. Did you know that over 95% of all dirt found in your house comes from outside? Soil, dust, pollen, air pollution and many other sources get into your house and cause an endless cycle of cleaning, dusting and vacuuming. If it seems that you’re continually losing this battle to the elements why not do something proactive? We suggest you enlist the following three lines of defense! Keep the outside of your house as clean as possible. Does it not make sense to keep as much dirt as you can in the great outdoors before it enters your house? We can achieve this quite easily by keeping the areas near any entrances free of sand, dirt, small rocks and debris which is easily tracked into your house. By sweeping and cleaning your sidewalks, driveway, patio, porch, etc., on a regular basis, you will prevent a lot of indoor ‘after the fact’ cleaning. Use entrance mats. Did you know that a good quality entrance mat can capture as much as a pound of dirt per square foot? This is much easier to remove from a mat than when it is spread through out your house. Use as many large, good quality, mats as possible, both indoors and outside. Also, clean them often and thoroughly. Capture the dirt completely on the first effort. What this means is to use tools and procedures that collect and don’t just scatter dust and dirt. High filtration vacuum bags, treated dusters and dust mops, clean rags, clean wash water, clean wet mops : all these will make your cleaning more effective and longer lasting. Stopping dirt in its tracks is easier if you use the three lines of defense! Treat the attic of a detached garage like the attic of your home, if it is insulated. If it is not insulated, the garage itself is likely not heated. If the garage has a musty smell, try to increase circulation by adding vents. Check for pests, such as termites on the sill plate and sills. Check for rodents inside, and if you find evidence there are a variety of different controls you can use from poison to traps. However you choose to remove them, be certain to seal up the way they entered your home to start with. Inspect weather seals, stuff mothballs or steel wool into cracks and holes. Sweep floor. Apply cat litter to spills of oil, antifreeze, etc to absorb substance. Use a heavy duty degreaser and damp mop garage floor to remove salt. Check for the storage of chemicals. Do the containers have labels? Are they out of reach of small children? Are the products still effective, or have they expired? Check you garage door opener. Lubricate rollers on door, hinges, and drive train. Put a 2 X 4 on the ground under the door. Close the door. Does it stop and rebound? Does it stop at all? If there is an infrared sensor, be certain the beam is lined up correctly, and that the wood interrupts the beam. If this is the case the door should not even start. This is the single largest moving piece of equipment in your home and you use it twice per day. Be certain it is safe and maintained and it will serve you for many years. If your garage is heated, clean furnace, change filter, and shut off gas for the summer. Check the drains around your garage. Is there a floor drain? Is there a drain in a below grade entrance? Is there a trough at the entrance (usually found when there is a drive way which slopes down into the garage) that needs to be cleaned? If you have a detached garage, check gutters, shingles, and the condition of the paint. Check CO2 and smoke detector batteries. Also check gauge or “Test” button on fire extinguishers. ABC dry chemical extinguishers should be turned upside down and tapped lightly to move around the chemical inside. Confirm expiry date. If expired, take to be re-charged and tested, or purchase a new extinguisher. The first thing to do is remove excess debris, use a pool skimmer or make a skimmer yourself by stretching an old pair a pantyhose over a wire clothes hanger. If the pond is really bad you should empty the pond and then clean, but do this no more than once per year by removing fish etc and draining the water for a thorough cleaning. Be sure to use a de-chlorinating agent for the water in the bucket or wading pool you’ll be using as a holding tank for the fish while cleaning (use 50:50 fresh water and pond water). Remove silt and debris from the bottom of the pond (it makes good fertilizer). If you have plants remove and place in a shady area so they do not dry out. Use a brush to scrape down the sides. When refilling the pond pour half of the holding tank water in the pond to inoculate the pond with healthy bacteria for the fish, fill the pond and be sure to use a de-chlorinating agent. Reintroduce the fish slowly by filling the fish holding tank with water of the same temperature as the water in the pond. Pour in half of the water from fish holding container into the pond, and then re-fill the holding container, and once it is full again, empty another 50% into the pond. Repeat this process to slowly change the water temperature, until the fish pond is full again. Be sure to also clean the filtration system, this is best done by rinsing with water as any soap residue will harm the fish. Removed much of the pond water before trying to net the fish, as it will be easier than trying to catch them with the water full. You shouldn’t clean your pond more than one per year since it take time for the beneficial bacteria to build up. If you want to clean without going to the extreme of empting the pond then use a rake and pull the debris and scoop it out, but be gentle so you don’t stir up the pond to badly. The easiest way to keep the algae down maybe to increase the scavengers in the pond and regular skimming of the pond to remove leaves etc. Snails, mussels and tadpoles all remove the wastes created by plants and fish inhibiting the growth of algae. A good rule of thumb is one scavenger per square foot of surface. A trickling fountain is a serene addition to any backyard, until white or green discoloration gets your blood pressure up. Scale, the white mineral deposits caused by hard water, and algae are the main issues when it comes to fountains. 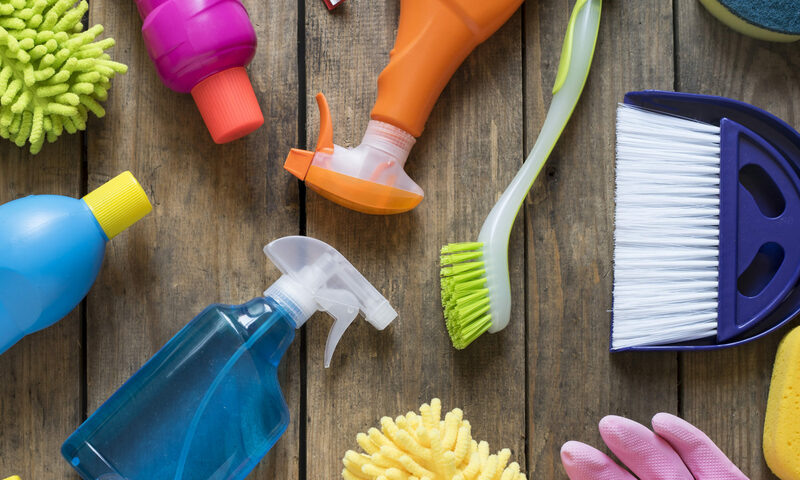 Sticking to a cleaning routine will help prevent either from taking hold. Both scale and algae build up over time. The more you prevent their buildup, the easier it will be clean your fountain. To prevent algae, use a commercial algae treatment, available at water-garden and fountain suppliers. Typically applied a few drops at a time once a month or so, these inhibit algae growth without the use of chlorine or other harsh chemicals. You can buy a similar commercial treatment for inhibiting scale,. It works the same way to keep scale from forming on your fountain, fountainhead, and filters. You use 2 to 4 ounces for each 10 gallons of water. If you want to not use the commercial products, clean your fountain as needed, usually once a week. For scale and algae, vinegar is one of the best cleaning agents you can use. Empty the fountain and, using a one-to-one solution of vinegar and water, scrub the surfaces with a nylon brush. The vinegar will neutralize alkaline mineral deposits, plus it has good cleaning qualities. Rinse well by spraying the fountain with the garden hose. Clean the pump and filter weekly as well. Remove the filter and spray it with the garden hose. If not, algae, especially the filament shaped kind, can clog it. Wipe down the exterior of the pump with a wet cloth. If the pump has mineral deposits, wipe it down with the vinegar solution and rinse with clean water. If you need to scrape algae or mineral deposits out of the intake valve, use the bottle brush supplied with your pump kit, or use a wooden stick, like a Popsicle stick. Metal can scratch the surface. Caution: To avoid the risk of shock, always unplug your pump before cleaning it. 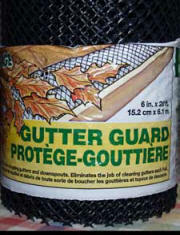 In the fall, after the bulk of leaves have fallen, BUT before the snow comes, you should check you gutters. 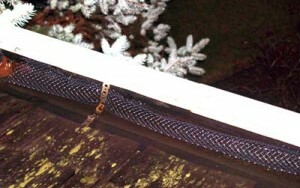 A clogged gutter can cause snow and water to back up underneath the shingles. This, with the freezing and thawing cycles of the spring and fall, can cause serious damage to a roof. It is also helpful in the spring to be sure they have not been damaged by these winter freezing cycles, and to be certain they will be ready for “April showers”. Use an approved ladder, preferably with an assembly that will allow the ladder to lean on the roof itself, instead of against the gutter. At Christmas time invariably someone gets sap on his or her hands and or clothes. Some say that you can use milk to remove sap from your hands. Or you can remove the sap with mineral spirits or denatured alcohol. Mineral spirits and denatured alcohol acts as a solvent to break up and dissolve the sap. Wash hands thoroughly after using the solvent on skin. • Saturate the area with a pretreatment stain remover. Wait several minutes for the product to penetrate. Rub the stain with a heavy-duty liquid detergent. Launder immediately. • Rub with detergent paste and launder as usual. • For extra heavy stains lay the stain face down on folded absorbent paper towels and apply dry cleaning fluid to the back of the stain. Let dry, rinse, and proceed as above. The most important thing to remember when cleaning walls is to start at the bottom and work your way up. If you start at the top, dirt water runs down the wall leaving very dirty streaks, however if you start at the bottom, any runs are much easier to wipe off a freshly cleaned wall. Semi gloss and gloss paints can easily be cleaned (this is what most kitchens and bathrooms have on the walls) a flat finish can only be cleaned if it is a light color. Dark colors tend to show marks very badly, and will usually look much worse than before being “cleaned”. Most painted surfaces can be cleaned with a mild solution of warm water and liquid dishwashing detergent and then rinsed with clear water. You’ll need two buckets – one for the cleaning solution and one for the rinse water and two big sponges. Working in overlapping sections, apply the cleaning solution to the walls by rubbing gently in a circular motion. Rinse with a separate sponge reserved specifically for the rinse water. After you’re done with one section, proceed to the next area, making sure that the cleaning edges overlap. When you’ve done several areas, dry off the excess moisture with an old terry towel. If the walls are very dirty, you can use a stronger solution to dissolve the dirt. Use a TSP (Tri Sodium Phosphate) solution, especially before painting. Use caution as TSP will dull all surfaces, and may remove paint, particularly flat finishes. Test your chemical in an inconspicuous corner first to make sure that the paint colour and finish are not damaged by cleaning. When using TSP, wear protective eyewear, rubber gloves, and a long-sleeve shirt. Always read the label for proper usage and safety precautions. Would you crawl into bed with a bunch of bugs? No? Well you do. Every single night. They are called dust mites, and they are everywhere. They thrive on dead skin, your dead skin. Yum. Yum. If you aren’t completely disgusted by now, check out our article on Dust Mites, to find out why they contribute to allergy problems. In addition to these dust mites, their feces, and all that dead skin they are waiting to munch on, your bed also collects dust, lint, hairs, and other assorted debris that is floating around our homes. Regular cleaning of your mattress, and the bed linen keeps these potential allergens in check. It also will increase the life span of your sleeping habitat. The mattress should be flipped over a couple times per year. It is a great idea to co-ordinate it with changing your clocks to and from day light savings time, or on Independence Day and New Years Eve, if you don’t have much of a life outside your home. The first time flip it over side for side, and the next time flip it over end for end (A note left between the mattress can remind you which way it is suppose to be flipped). This equalizes the wear of the mattress, and minimizes peaks and valleys. It is also a good plan on “flipping day” to vacuum the entire mattress and box spring. If you use a plastic mattress cover, wipe it down after vacuuming with a disinfectant. Plastic covers are a must for young children who might have a periodic bed wetting accident. If you don’t have a cover when one of these accidents happens, check out the tip in our data base on cleaning urine from a mattress. Although thought to be owned only by starving college students, there are those of us who have grown to love our futons. Like mattresses there are dozens of different firmness levels, and methods of construction depending on the manufacturer. Typically there is a foam core, wrapped with cotton, in a heavy cotton fabric envelope. When cleaning, you should avoid getting a futon too wet, as it takes forever, or possibly longer, to dry completely. A moist futon is a bad thing, as warm, moist, dark areas tend to grown things (like fungus and mildew) that we don’t normally want to sleep with. Stains should be removed with as little water as possible, and usually blotting with a damp rag will remove most surface stains. Futons should be rolled up every couple of months, and allowed to stay rolled up tight for an entire day, if possible. Turning them frequently will also lengthen their useful life significantly.